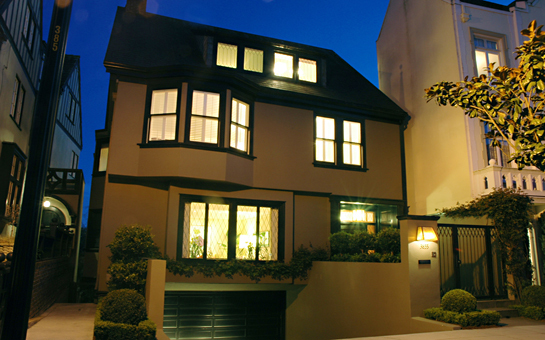 This charming English style residence is situated on a quiet tree-lined street in prestigious Presidio Heights. The architecture is a blend of English countryside and American craft styles built in the early 1900s. Fine wood carved detailing, beautiful hardwood floors, art glass windows and period light fixtures are in character in this impeccably maintained home. Expansive view slate terrace and a sunny landscaped garden are signature features of this charming family home. Gated entry opens to the handsome slate walkway with sculpted greenery and colorful blooms to the covered entry with glass lantern. The classic front door introduces the architecture of the house with patterned leaded glass transom and sidelights. Enter the inviting FOYER and the spacious LIVING ROOM to the left with coved ceiling, fireplace with marble surround, handsome wall-to-wall bookcases & cabinets. The wide bay window with bench seating looks out to the tree-lined street. The English-American crafts motif continues in the formal DINING ROOM with tall wainscot surround, marble fireplace, side table with marble top & ornate wrought iron base. A large bay window with bench seating looks over the south garden. Ascend the wainscotted staircase. The sunny & spacious MEDIA/GAME ROOM features a fireplace with granite hearth and state-of-the-art home theatre with built-in surround sound and 45” flat screen television. A large bay window overlooks the south garden. An alcove adjoins with Sub-Zero 48 bottle wine cooler and wet bar with mirrored marble top. A BATH with shower adjoins. The private MASTER SUITE is located on its own level. The MASTER BEDROOM with tiled foot warmer and bay window outlooks to pretty houses & trees. Tiled MASTER BATH with spa tub, separate shower, pedestal sink & large dressing area with custom storage. The second BEDROOM, with full bath and steam shower, adjoins the master and is currently used as an office. Ascend to the STUDY which opens to the delightful, sunny VIEW TERRACE paved in slate. An ideal setting for outdoor enjoyment with wonderful south and westerly views of the cityscape. Two front BEDROOMS feature gabled ceilings and leaded glass windows. A FULL BATH with tile surround & designer sink adjoins. Spacious GUEST SUITE with full bath, large picture windows, built-in bookcase & bar refrigerator. Double glass doors open to the expansive sunny SOUTH GARDEN with beautiful lawn for children’s play and a delightful patio area. 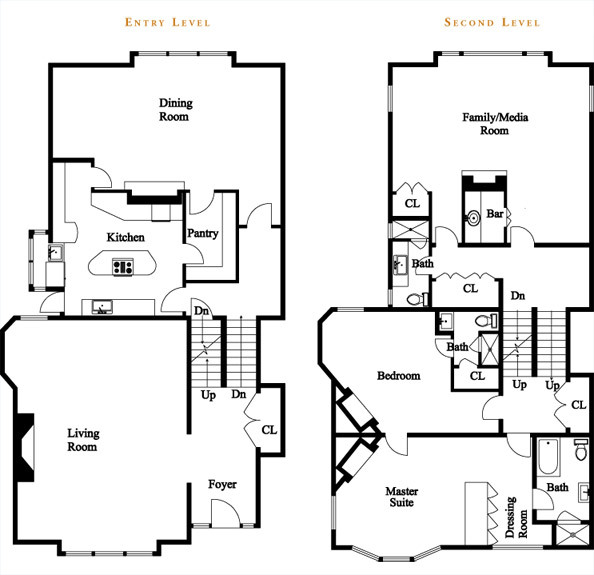 2 car side-by-side GARAGE with interior access, washer/dryer and large storeroom.